The small footprint of the new CL-E300 makes it a perfect printer for tight spaces but still allows labels up to 4.5 inches wide to be printed on a 5 inch media roll. With an on-board Ethernet LAN interface as standard together with USB and Serial interfaces, the CL-E300 is perfect for all applications. 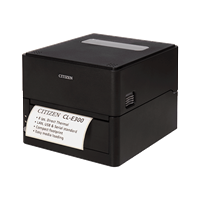 Citizen‘s LinkServer™ web management and configuration system is integrated to allow full printer control. *3: The OCR font may have a low recognition rate according to the reader. *4. It is equipped with UFST™ and TrueType™ raterizer that are licensed from Agfa Corporation.